Mention “cybersecurity” to the owner of a small business and his or her eyes may glaze over. Everyone knows that hacking is a problem, but small business owners often think their companies are too insignificant to worry about such dark possibilities. Not so, warns Rob Arnold, a cybersecurity expert and founder of Threat Sketch, a company that helps companies big and small manage cyber risk. He’s condensed his vast knowledge and experience into a slim volume to convince small- and medium-sized business owners that they should pay attention to the looming danger of cyberattacks, and that they should be involved in the cybersecurity process, instead of outsourcing the task to IT staffers. 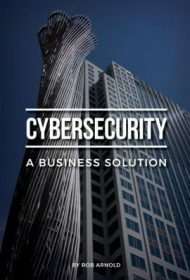 Cybersecurity: A Business Solution is a guide to help companies’ senior leadership understand what the risks are and the steps they can take to minimize them. Arnold avoids being too didactic or academic. His language is plain, not jargon-ridden. He focuses on nuts-and-bolts tactics like “regulatory compliance,” “controlling costs,” and hacks that can affect “point-of-sale” processes. He also uses many helpful tables and bullet-point lists that reiterate points from previous chapters. For instance, a table of “Risk Management Milestones With Clear Role Assignments,” starts with “Set a Risk Management Objective” and ends with “Implement and Repeat.” In subsequent chapters, he drills down into each milestone so readers know what to do and how to do it. In the end, if you’re a business owner, you may decide not to implement the tips that Arnold offers—but at least you’ll know what you’ll be risking.